Well, here I am on Monday, having thought I'd have my post ready and realized I didn't do it! Blank mind. Blank page. So sorry! That is NO reflection on the Challenge, in fact, it is exactly the opposite. I have so much to write about this year's challenge that it boggled my mind and voila, nothing got posted! Oh dear. 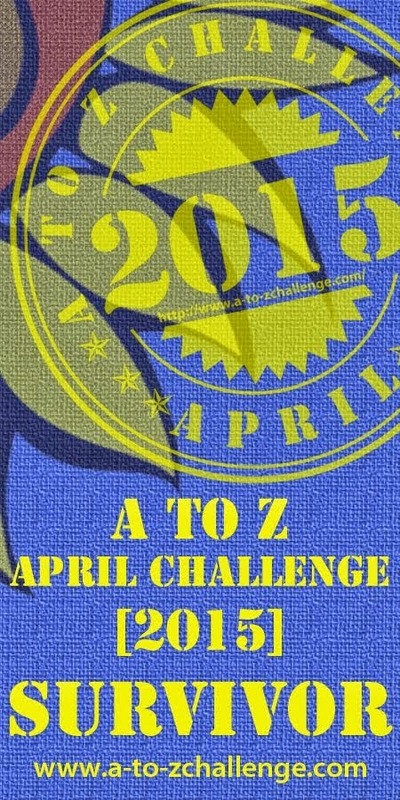 This year the A to Z was amazing, tiring, fulfilling and a test. First, I volunteered to co-host, and had two wonderful teams (the A to Z team and Lisa's LiveWires!) that helped me through, and second, could I get across my love for my birth state and the part of it I like the best? Going from my comments received, I think I did all right, and my teams rocked! The blogs I visited, the people I communicated with were so unique, uplifting, interesting and diverse, that I traveled a daily journey that took me from Cornwall, Russia, India, Burma, France, Canada, Texas to a new artist (who's prints I bought) to new authors (books bought), limericks to die for, and the Twilight Zone, and Gods/Goddesses, and musical instruments, and well, I could go on, but will stop here... I won't list blogs here because I don't want to forget any, and the list is looonnng! 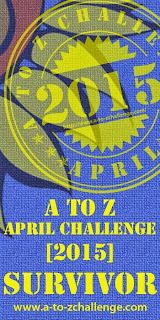 The only thing I didn't enjoy this challenge, was the problem of finding blogs, and A to Z posts on some of those blogs. Some folks didn't leave "active" links with their comments, so that I could find my way to them easily, others left links that went to the blog, but not to the A to Z posts! Honestly, if that was the only negative, that is small compared to the over all. Thank you for dropping by. Thank you for being a part of such a wonderful experience. I look forward to more blogging fun in the future! Melissa! So true, and soooo sorry! I totally dropped the ball this morning, but have now remedied that! I know a lot of other folks are wondering what happened, and I hope they check back! Wakey wakey young lady. Anyway, you made it in the end. I'm offended,you didn't mention Canada LOL. It is amazing how many countries one visits via blogland. Don't think I got to Burma but certainly India. Luv ya. I went back and change my post Jo! I wish I could list every blog I liked! But then I'd look like the link list! You really shouldn't have bothered. I was only teasing you. I agree. It was frustrating to have a comment, but then have to track down the person's blog to respond in kind. Other than that, things went smoothly. I enjoyed learning more about Florida. Glad you had a good time as a co-host. It's different on the other side, isn't it? Thank goodness! One of the reasons I love you! Stickability. Yes, it's a word. That is my story and I'm sticking to it, ha ha! It was a lot of fun! I'm so glad I found your blog. Me too, Nadine. I really enjoyed yours as well! I had the same problem with some blogs. It was difficult to find their posts and it gets frustrating. I enjoyed your theme and seeing all the places I wish I could visit. I'm going to be more consistent with leaving a way to link to me in my comments. Sometimes I forgot to add my link at the end. I'm making a note to be sure I don't forget in 2016! C. Lee, you were easy to find even so. Because your name actually leads you somewhere. I loved your posts, btw! Every year I learn something new about the challenge. If I keep at it long enough, I'll know everything there is to know, ;-). I know diddly about North Dakota Mark! Glad I didn't write about it either! Well done on blogging and co-hosting, and thanks for visiting my blog so many times :-) I met a lot of new bloggers this year as well. You might be on to something with your comments about not being able to find blogs and blog posts. Just to be clear, are you talking about linking to the most recent A to Z post, or to all the A to Z posts? John, I meant linking to their blog period, not the A to Z posts, though as mentioned, sometimes that was a pain as well because it wasn't clear where the A to Z post was...You know how you can click on your commenters names and it takes you to either Google or wherever? Well, some had no way to find their blog from their Google link. Then some made it difficult to find how to comment. That was truly a pain as well. I wish there was more sharing between blog worlds like WP and Blogger... I enjoyed working with you as well! Thanks for all your support! Onwards and upwards! I also had the problems with the list and finding the blog. Sometimes I'd get sent to their website, or their blog would be a mashup of posts and I had to hunt for the one for A to Z. Oh, it was a headache! I noticed not a lot of commenters had signatures when commenting. Most did put their blog into the form so I was able to visit easily enough. Thanks for all your posts. I enjoyed reading very much. Also, thanks for stopping by my blog on a regular basis. Learning a bit more about Florida was cool and got me thinking about all the A-Z topics I could come up with in Milwaukee. I really loved this particular challenge as well. It worked out very well for me! And there were definitely some awesome posts this year. Thanks for co-hosting! Everyone appreciates the hard word you do to keep things running smoothly. Kudos to you and the other hosts for pulling off another successful AtoZ! I had a blast! Thanks, Lisa, for all your hard work as a co-host--so very much appreciated. Hi Lisa - I loved seeing 'your Texas' and reading your memories .. and I really was enticed to visit a few places - at some stage in some future time! Very happy to be finished with the challenge! Very happy to have met you too through this alphabetical race. Hope to read more about your work as well. I'm on my A to Z Road Trip, and I finally had a chance to go back through and read all the posts I missed during the Challenge. I enjoyed reading all about Florida, and yes, you conveyed very well your love of your corner of the world. Thank you for all the informative posts and lovely photos! The baby hippo was adorable, and I'd love to go walking on the beach and see all those shells. The blue springs were beautiful and looked like so much fun to swim in. I had no idea that Florida has a prairie. I always thought those were out in the Midwest. I hope you solve the Rocky Point mystery some day. My son, the Nascar nut, would LOVE to visit Daytona Speedway, and I wouldn't mind visiting the Aviation Museum. I've added South Moon Under to my TBR list. I'd be hard-pressed to pick a favorite post, but I think I would have to pick the one about the Lichgate Tree. Huge trees like that seem magical to me. What a wonderful place to get married. Thanks again for the tour of Florida!